The Beatles Through The Years: Paul McCartney's Shea Stadium Jacket. 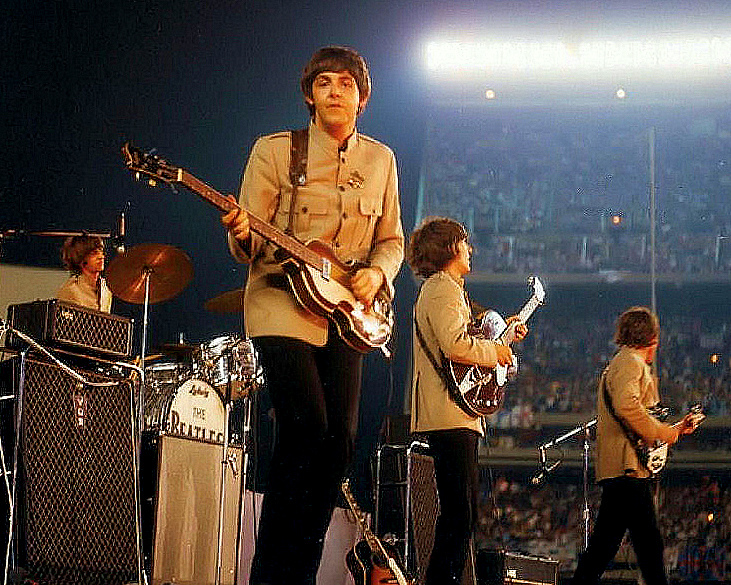 The Beatles live at Shea Stadium, August 15th, 1965. On August 15th 1965, the Beatles went where no other band or solo artist had gone before. They played the first concert at a Stadium. The stadium was Shea Stadium in New York City and they were seen by thousands of fans, opening up the concept of "Stadium Rock" which is now the norm. Paul McCartney's Shea jacket is owned by R.W. Lease who has kindly loaned it to the Grammy Museum so that it can be part of the travelling exhibit. The Wells Fargo badge that Paul wore on stage at Shea with the Beatles in 1965. If you haven't checked out the Beatles exhibit at the LBJ Library in Austin, TX then if you are in the area, head down there now. A splendid time is guaranteed for all! People were wearing Wells Fargo badges at Paul's concert in Philadelphia, which was held at the Wells Fargo Center. The Well Fargo driver who helped in the badge ceremony was given a Beatles album by the Beatles, signed by all four!